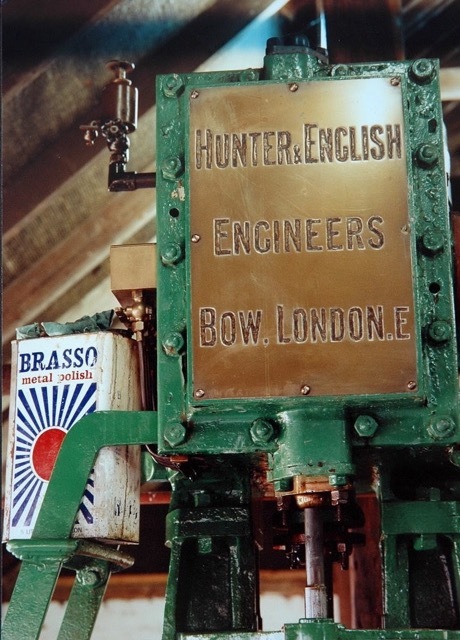 From 1791 until 1921 the firm of Hunter and English manufactured and repaired steam engines in their works at 202 Bow Road, London. This engine was supplied to Poplar gas works in 1900. It was coupled directly to a Beales rotating vane exhauster. before distribution to consumers via the gas main. DONATED BY North Thames Gas. TYPE Single Cylinder Inverted Vertical. 45 HP. BUILDER Hunter and English, Bow, London. 1900. CYLINDER 12 inch x 16 inch. Stroke. VALVES Simple Slide Valve, with provision for additional Meyer Expansion Valve.